The eighth annual Mount David Summit, Bates College’s annual celebration of student academic achievement, takes place April 3. More than 280 students are participating in this year’s summit. In concurrent sessions throughout the afternoon at Pettengill Hall, participants present research posters, short talks, panel discussions, a photography exhibition and film screenings. The Mount David Summit is an opportunity for Bates students to share recent research, service-learning and creative work. 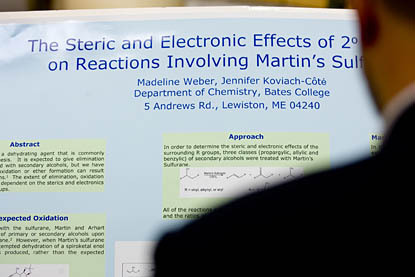 More than 100 research posters represent work in Asian studies, biochemistry, biology, chemistry, Chinese, economics, education, environmental studies, history, mathematics, neuroscience, physics, politics, psychology and public health. Friday, April 3, at 2:30 p.m.